Last year I have introduced Quack Quack parents. Hope you still remember them. They were accepted very well and have seen many of them done for the past few months. One of the nice blog followers who is with me since the first day I started here is dear friend Amanda Turner. She came up with completely new pattern using the Quack one I made. She made duckling and drake first, but then was missing the baby. In order to do that she cut the original pattern in half; rows, stitches….and came up with baby duckling. Miniature, miniature duckling to make and add to duckling family. Amanda sent me the pattern to try out and I was thrilled the way duckling was coming out. First one I made was with 5 ply cotton yarn and 2 mm hook and it ended up not bigger than 6 cm (2 1⁄2″). Being so sweet and huggable decided to try to make one even tinier than that. Grabbed 1,5 mm hook and thread no.10 and made little baby duckling of 4,5 cm (2″) tall. What can I tell you except Amanda did great job. 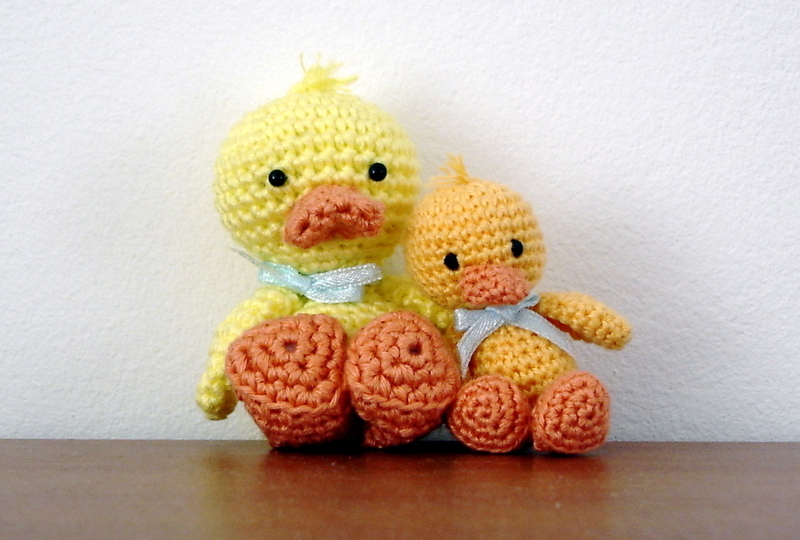 Pattern is easy to follow, easy to make and duckling is more than adorable. I have already added the .pdf of the pattern you can find here, under Free Patterns page. Hope you will enjoy these little ones as much as I did! All thanks to Amanda and her great job done making this pattern available for us. Hi, I just had to tell you again how wonderful all of your patterns are. So easy to follow and I just finished a DUCK family-Mom, Dad, larger child duck and 2 babies. Crocheted Mom on a short trip 2 wks ago while hubby drove. The smaller ones were quickly crocheted and I so enjoyed making them. I’ve also made several of your dolls, LOVE THEM ALL, gonna make more!! So THANK YOU AGAIN for all the great patterns you share. HI, I just had to say thanks again for all of your wonderful patterns that you share with us. I just finished a family of ducks, Mom, Dad larger child and 2 Babes. this pattern is so great, works up fast and so easy to follow. I have made several of your other patterns and they are also easy to follow. SO THANK YOU SO MUCH. Thanks for taking your time to stop by and leave me the message.